For years it slumbered in darkness, deep within the earth. An Old God, maybe even the First God, its hibernation marked by rattling breaths reverberating in the deep like cinderblocks dragged across wet asphalt. Sleeping… resting. One day to wake. And in the year 2012, the day of awakening arrived, and the great PC Gaming God rose from the depths and wreaked terrible destruction across the world of console gaming. 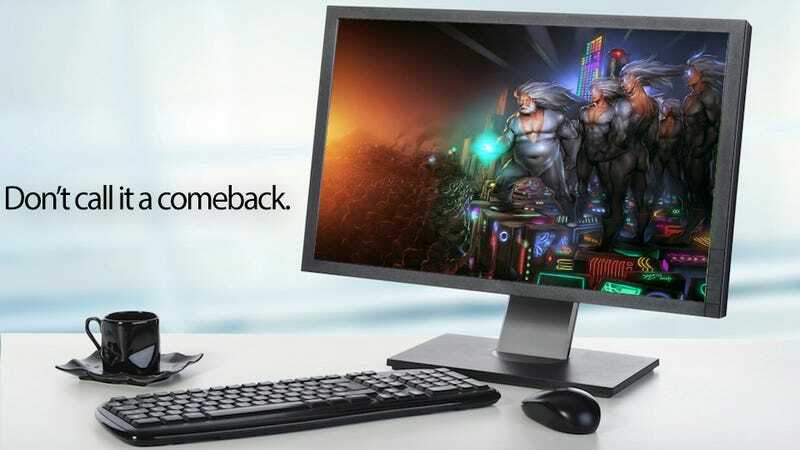 Yes, 2012 was likely the year we'll think back on as The Year The PC Returned. While of course, PC gaming never "went anywhere," not really, there was a definite sense that it got backburnered for a few years there. No longer. It's possible to put together a good gaming PC for cheaper than ever. Indie developers have fled the restrictive clutches of consoles and found a welcome home on Steam. The modding scene has created game after game after fascinating, fun game. Classic games have gotten easier to play than ever, thanks to services like GOG.com, and the sorts of PC adventure and role-playing games we grew up with have been granted a second wind thanks to Kickstarter. Steam has become living-room friendly, and most developers have cottoned to the fact that they can do well by creating superior PC versions of their games. Kotaku launched a regular series called "PC Gaming Lives," which eventually began to feel unnecessary, since PC gaming wasn't just alive, it was thriving. I started playing an MMO, and actually enjoyed myself. And so in the sprit of the year that was, let's look back at the many stories that shaped the re-ascension of PC Gaming. Is Windows 8 the Biggest Threat to the Future of PC Gaming? Why Did I Become A PC Gamer? Because It's the Cheapest Way to Play. Why Did I Become A PC Gamer? Because It&apos;s the Cheapest Way to Play. The true heart and essence of Guild Wars 2 lies in its map. As it turns out, I was born to be a Dragon. There was a moment on Sunday when I thought the PC gamers had been hiding something from me.